We expected to see Cortana and more multitasking features, but Microsoft says some of the limitations are by design. 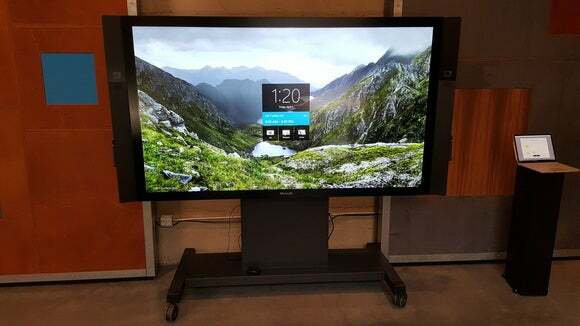 For $21,999, I expected a little more from Microsoft’s new Surface Hub. Don’t get me wrong: the Hub's 84-inch 4K touchscreen, flanked by a pair of eye-height, 1080p cameras, videoconferencing, and full Windows 10 capabilities—all makes for one very impressive package, especially when it dominates one wall of a room. Heck, it practically is the wall. 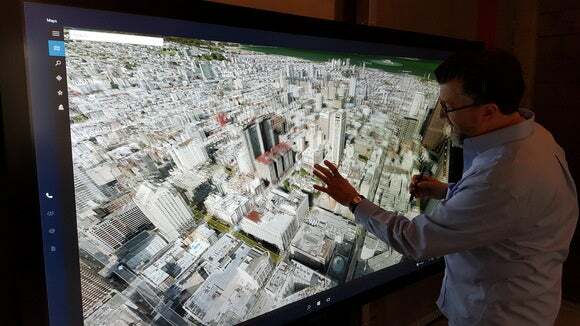 Microsoft’s Surface Hub is, in a word, enormous. But what Microsoft executives called "version 1.0" of the Surface Hub lacks capabilities I can't help but think most customers would expect. There’s no co-inking. Presentations can be saved, but just as a final image—you can’t save audio or a “recording” of the collaboration. Cortana is absent. You can use Windows 10’s nifty “snap” feature to shift windows across the screen, but only two can be shown at a time. None of these may be deal-breakers, but the Hub’s spartan capabilities made me question how mature the Hub's productivity argument is, 15 months after Microsoft first began showing it in Redmond. (The Surface Hub began shipping just before I saw it last week at Microsoft Build in San Francisco.) What Microsoft executives made clear, however, was that some of the omissions were deliberate. It helps to avoid thinking of the Surface Hub as the big brother of Surface tablets, because it’s not. The Surface Hub is a communal device, not a personal one. Designed for collaboration and communication, it entirely lacks persistent local storage. Previously, Microsoft said its integrated cameras could recognize you; that’s not the case now. When you walk in, the Hub is a blank slate that’s ready and waiting for your team to use, and when you leave, the Hub wipes itself clean. A closeup of the interface. 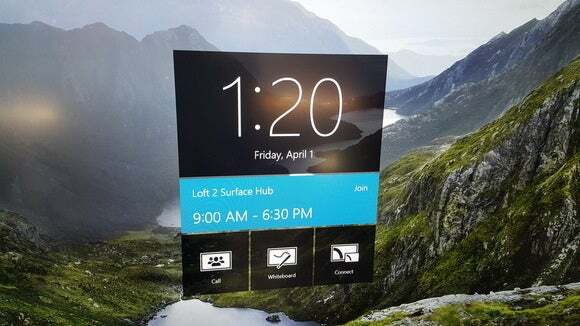 When you logout or the meeting ends, the Surface Hub wipes itself with a ten-second countdown, then it resets for the next user. In fact, those are exactly the capabilities that the Hub highlights when you walk in, with a very Bing-like login screen that shows off a clock and three apps: Call, Whiteboard, and Connect. Not surprisingly, they repurpose familiar Office apps: Skype for Business, OneNote, and the ability to connect a secondary display. You can also connect to the Microsoft Store and download any other UWP apps your administrator has approved, if you need to supplement those basic applications. Looking into the Hub is like looking into a window. A word about the hardware: The $21,999 84-inch model I saw measures 46.12 x 86.7 x 4.15 inches, and weighs a whopping 280 pounds. Inside is an entire PC: a 4th-gen Core i7 chip (yes, you read that right, it's Haswell) with workstation-class Nvidia Quadro K2200 graphics powering the 120Hz, 4K (3840x2160) display, a 128GB SSD, and 8GB of RAM. (The smaller $8,999 55-inch model is only 1080p, with a 4th-gen Core i5 inside, but that’s still a decent amount of horsepower at your disposal.) Connectivity includes ethernet, 802.11ac Wi-Fi, Bluetooth 4.0, NFC, and Miracast. The latter is important, as it’s apparently the only way to connect wirelessly to the display. The Surface Hub cameras perch on either side of the display. Of note are the two 1080p wide-angle cameras flanking the display, at eye height. 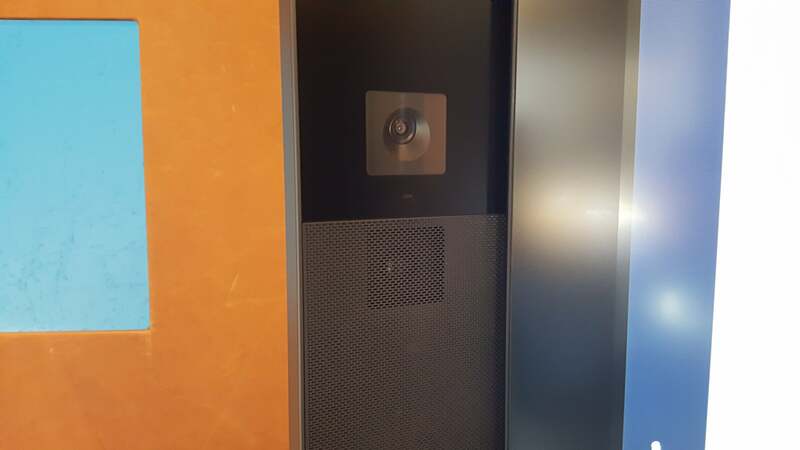 Microsoft executives played these up, and for good reason: When videoconferencing, the high position of the cameras gives the illusion that you’re speaking eye-to-eye with the person on the other side of the screen. Add the cameras' 100-degree field of view to the massive display and result is almost 1:1 perspective: You can look at a room of people on the display, and they look properly sized. The Surface Hub becomes less like a videoconferencing device and more like, well, a window. 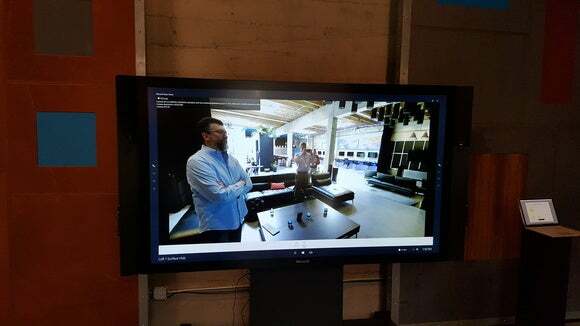 Still, the message I received regarding the Surface Hub is that it will operate best when every member is in the room. If you happened to be stuck in traffic or working at home, you’re going to have a more difficult time. 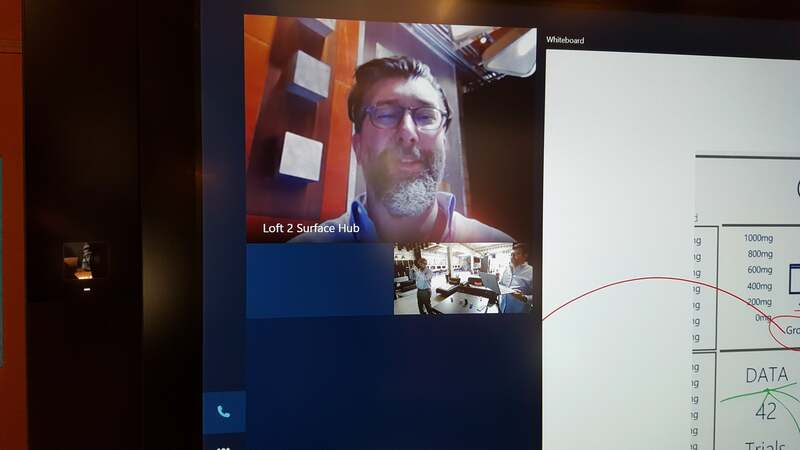 Calling another person or conference room via the Hub appears to work smoothly, as you might expect, and the image dominates the screen. While it’s not clear exactly how many other parties you can call, Microsoft tells me that you can connect up to 250 people, consistent with the number you can connect to Skype for Business. Microsoft also says that you can connect your laptop to the Hub via the Connect app, then share your screen via Call. 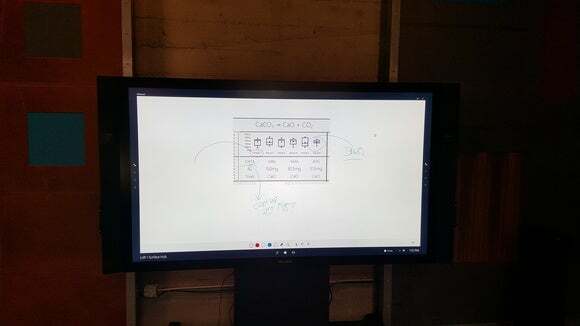 Videoconferencing on the Surface Hub tucks the window in the corner of the screen, delegating the rest of it to the whiteboard and other apps. Given that you can snap only two apps—with 84 inches of screen space, this seems a little stingy—you’re limited to just a few onscreen activities at any one time. (Placing a call seems to be allowed at any time and effectively serves as a third window.) This keeps teams focused, though it limits what can be done with the Surface Hub at any one time. One of those activities is the Whiteboard app, which allows for three people to ink on the screen at any one time. The Hub ships with a pair of pens, holstered on either side. Once you remove a pen from the holster, Whiteboard launches. Icons appear on the bottom of the screen so you can choose ink color, among other pen options. Unlike the Surface Pen, there are no other buttons on the Surface Hub pen, though you can “erase” by flipping it over. You won’t find any fancy icons, brush motifs, or digital stickers in Whiteboard; each pen has a choice of what appears to be five colors, and there’s a lasso tool for moving digital ink around on the page. Because the Hub supports 100-point touch, a number of hands can be on the board at any one time. Naturally, pinch and zoom gestures are supported, and the Whiteboard app is an “infinite canvas,” so you can just keep drawing forever. 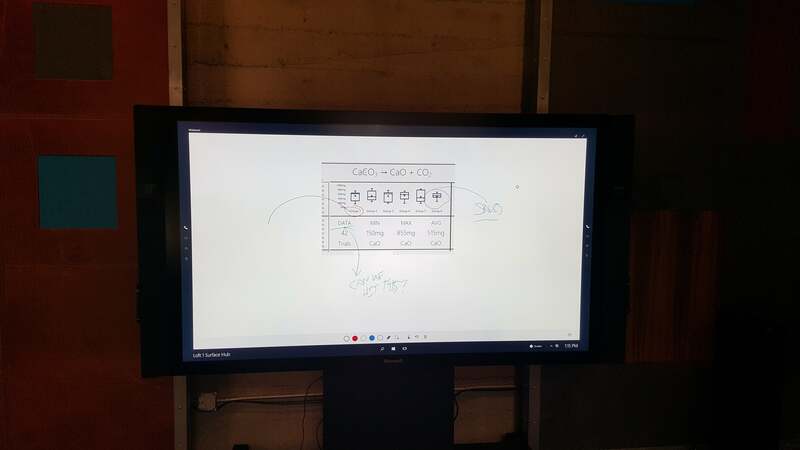 The Surface Hub’s whiteboard app has basic inking capabilities: a choice of several colors, and a lasso for moving text selections. Whiteboard comes up a bit short when compared with OneNote, however. You can't record the process of digital inking to see exactly how an idea evolved, as some digital whiteboards do. The end result (either a PNG file or a OneNote document) is more like a cave painting that can be emailed to remote workers. Audio isn’t recorded via the Whiteboard app, either. A workaround, however, comes in the form of the Connect app, which allows anyone in the room to connect wirelessly to the Hub and control it. One interesting twist is that you don’t need to hold your Surface (or a Lumia phone) in your hand to drive your presentation. Instead, the Hub lets you "drive from the front," remotely controlling your laptop and any files you have stored in it. Other users can’t co-ink your presentation, though, unless you drag an image from it into the Whiteboard app. You’ll also have to pull a co-inked image back into your presentation manually. 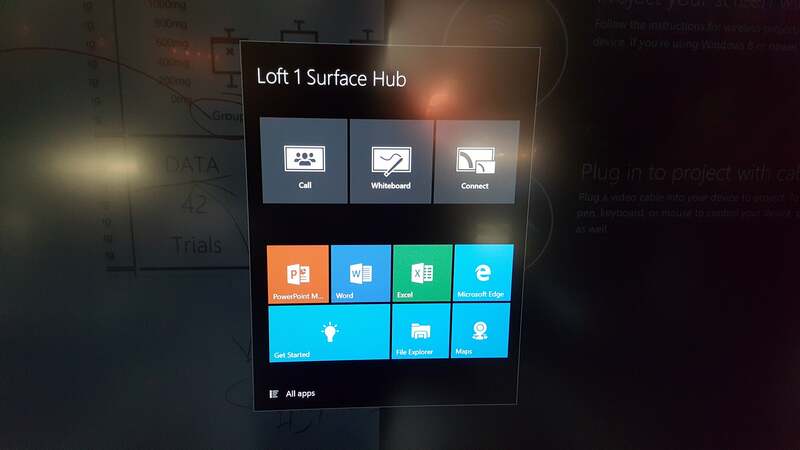 There’s a simplfied version of the Start menu on the Surface Hub. Cortana's absence was a deliberate choice. Greg Sullivan, a director in the devices group at Microsoft, said that Cortana was a “personal experience,” and Microsoft hadn’t decided whether to make a version of Cortana into something like a group admin. 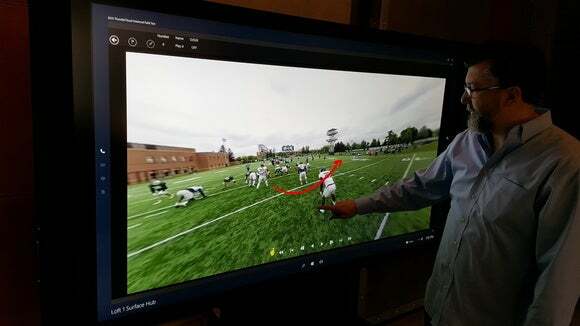 Mixing 360-degree video with a telestrator app may not seem like the ideal use for the Surface Hub, but it works. Because the Surface Hub is a communal resource, expect the Windows Store to be locked down to what your IT department allows. Sullivan and other executives showed off a Siemens app that translated digital inking into straight lines, part of the process of sketching out the basics of a 3D object. Don’t expect to buy Microsoft’s Surface Hub yourself, either. The $8,999 55-inch version and $21,999 84-inch version are designed to replace the whiteboard and videoconferencing system currently found in conference rooms where teams meet. Chances are, however, that you will not be playing Halo after hours directly on the Surface Hub. Unless you sneak in your Xbox One into work, that is.